I worked at the Woolworth’s London Rd store in 1973/74 as a stockroom boy, when I first left school. My wage was £10 per week rising to £14 per week when I left in 1974. Woolworth’s store was a big concern with a lot of staff. There was the manager and his assistant, together with about five floorwalkers who were suited men who managed their own departments. There were probably about twenty five assistants on each shop floor. This was increased on a Saturday when about twenty schoolgirls were employed to help out. The store was organised very differently then, as there was at least one assistant on each counter, and none of the check-outs we see these days. The basement used to sell haberdashery; paint, which we used to dread in the stockroom as it was so heavy; gardening items including plants that we used to have to water twice daily on the roof; household items like ornaments etc; DIY and toys. The ground floor was for food; soap powder; confectionery; records (yes we used to sell the top ten in those days); a butchery counter and a deli counter as well, added to this was the long tea bar at the back of the store. Upstairs on the first floor we had a canteen for the staff that used to provide excellent meals and snacks when we had our tea breaks. This may seem a bit strange as it was only forty years ago, but the women had their own canteen and us men had a smaller room on the other side of the cooking area. The women also had a hairdresser who came to the store once a week. The stockrooms were vast, especially the top floor; we used to have countless deliveries as the turnover of stock was so fast. We had a couple of Saturday boys to help out, and two retired chaps, one on each floor, to operate the ‘baling machines’, these were to flatten all the cardboard into neat bundles. There were four of us in the stockroom, two managers and us two boys. I may have forgotten some of the details, but what I do remember is that it was hard work and we hardly ever stopped. 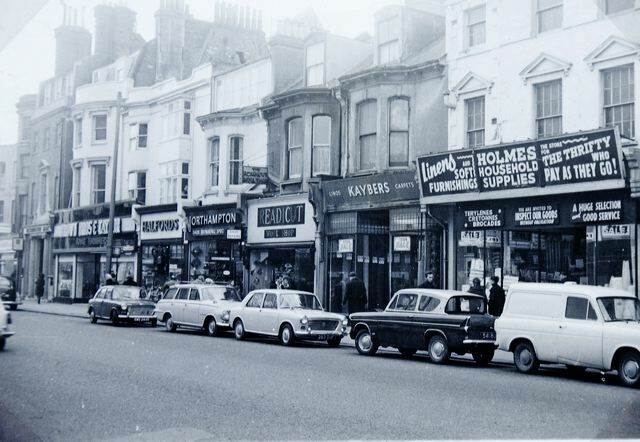 It is difficult to realise now, when you see how London Road has changed, but in the 1960/70s, it was a bustling shopping street with loads of good stores. I believe the downfall began when Marks and Spencer moved out. How many people remember Ina’s (later Diplomat); Boots Audio; Carnaby Styles in York Place; The Elephant & Castle pub and A.A. Bakers where we used to buy our Subbuteo teams. Do you have any memories of London Road Woolworth’s store? If you do, please leave a comment below. Just a few more shop names to conjure with: Ashplants (toys), Hare and Hounds Pub, Birds Nest, Uncle Sam’s burgers, numerous shoe shops including Timpsons, Sainsbury’s, Bellmans, Co Op, Maynards. When I visit Brighton from Devon I’m always shocked at the sad decline of what was one of Brighton’s better shopping areas. You’re quite right Martin, there has been a steady decline but hopefully things will turn around very soon. My memories of London Road in the 60s are quite clear. When I was a small boy we used to get the 13 bus down to Elm Grove and walk through Union Road as no buses went direct to London Road from Moulsecoomb where we lived in those days. There were always two routes into London Road, if it was a ‘haircut’ Saturday then en-route to London Road we would go to ‘Youngs’ in Baker Street, my Dad used to go to ‘Coopers’ as he had had his haircut there since the 50s. If we needed fish or meat then we would go through the ‘Open Market’ and then into London Road. ‘Bellmans’ was where we would go to buy our records, 6s/8d for a single and usually 33s/11d for an LP. You could get everything you needed in London Road as there were plenty of shops. Does anyone rember ‘Wicks’ in Ditchling Road at the top of the Open Market? I think most Brightonians bought their first train set or Scalextric there. I remember buying Airfix kits and Meccano there as well. My sister, Sylvia, worked on the tea bar for some years and I’d often pop in to be treated to a milkshake & doughnut. I remember the tea bar well, it was very popular. Early each morning before the store opened, the Manager and Floor-walkers used to stand at the tea bar having a drink. The store used to open at 9pm and us stockroom boys used to start at 8.30pm. One morning I was late and actually came in the door at the front and got on my hands and knees to try and get to the door leading up the stairs and avoid being caught but it was no use as they had seen the front door open, I accepted my telling off and was never late again. I bought my first bra from that Woolworths (I remember it well, it had rosebuds on it), although I probably didn’t need one really, that must have been in 1961. I was most embarrassed one day as I took my dog in there a couple of years later and he did a poo all over the wooden floor! As for Bellmans, my dad bought me a lovely swimsuit from there as I passed my 10 yds, it was red with a little skirt attached. My mum worked in a jewellers almost next to Bellmans on the corner but, I can’t remember what it was called. The manager or owner had a fantastic train set upstairs, it filled the room! When I left Margaret Hardy, I worked for 3 weeks in De Marco Brothers ice cream parlour almost next to my school. Wonderful ice cream and all different flavours. I went to train as a sewing machinist after that at Claytons in Hove. It’s not quite as nice on London Rd now, I was down about 18 months ago - shame. I remember Wicks on the corner by the Open Market. As a lad it was the first place I headed for after getting off the 44 bus with my parents. As we walked through North Laine to catch the 1a bus back home, we always stopped in De Marco Bros for a drink. When I was older I attended the Technical College on The Level, so my lunchtime drink was in the Elephant and Castle pub on London Road by the Open Market. The pub was knocked down some years ago and a new parade of shops was built in it’s place. I managed a shoe shop in London Rd called Easiphit. Dearest price of shoes was £4.19.11. Before that I worked at Sainsburys along the road. Those were the days - they say “good ole days”. I worked at ‘Wallstyles’ [Crown paints] near the Preston Circus end in the late ’60. My brother David was head/only projectionist at the Dukes and his best mate was a leading fireman, all in a square quarter of a mile. In the late fifties I worked at 55 London Road – Sainsburys. We went for training in London for a week,it covered all aspects of counter service including learning to cut cheese with a cheese wire,using wooden butter paddles to weigh out the correct amount and wrapping it neatly into paper parcels for the customer. The deli counter was always the busiest and I think her name was Daphne Bish who was just brilliant,she was so quick and efficient. I worked on the cheese counter and loved it,we only had a small selection of cheese in those days,mainly cheddar. We had a clean uniform twice a week provided by the live in Housekeeper.We had our own tills which we were responsible for,the admin staff worked in a small section at the back facing the shop and customers.They were good days,long before self service supermarkets. Anyone remember Barrie’s ladies’ hairdressers along near Rosehill Terrace? I used to work there in the sixties and early seventies. It was a no appointments system, just walk in and wait your turn. We did quite a few of the factory girls from Allen West etc. on Saturdays. Brilliant times and lots of laughs. They moved along the road to Preston Road in the early seventies and continued here till around the early eighties. Not sure if my memory is playing tricks with me but does anyone remember a man selling newspapers from a small hut on the pavement outside the old Woolworths in London Road on the corner of Cheapside Road? This would have been mid-late 50s. I believe Vince Wild sold the newspapers from his little wooden kiosk near where Aldi/Iceland is now. Vince did a lot of work in Lower Bevendean in setting up the BECCA children’s centre. Sadly, Vince passed away about a year ago. Thanks Ken, I can still see that hut, as if it was there yesterday. He used to stand out in all weathers selling his papers & mags. My Dad was manager of the Woolworths in Blatchington Road Hove and I used to work in the stockroom during school holidays in the ’60s (nepotism rules). One time when he could not use me, he arranged with the manager at London Road (George Waite, for anyone that might remember) for me to work there, in the stockroom. I cannot remember the layout or anything else about the place. Hi Paul, George was still spoken about when I worked at London Road in the 70’s. If you worked in the stockroom I have a couple of names that might jog yours or anyone else’s memory. There was a lady called Joan who had come from the original store further along London Road before it was closed, she was quite fearsome and didn’t suffer fools gladly, especially us young lads sometimes clowning around. She knew the stockroom inside out and was very knowledgeable. There was also a lady in the office called Doris Pym who I liked, she was a very nice lady and she had been there years when I joined. The stockrooms were very large and a lot of stock went through them. I remembered recently that I moved a box containing 12 bottles of ammonia one day only to find out as I lifted it that one of the bottles had broken and made the bottom of the box all soggy, yes you guessed it, the other 11 bottles smashed all over the floor! You can imagine the smell and it took over the whole floor, we couldn’t go in there for hours as everyone’s eyes watered. I was told off for not being more careful but the floor was lovely and clean after that. Joan wasn’t very happy as we had a cat that lived in the stockroom and she couldn’t find it for a week! Just to say Hi to everyone who I worked with at Woolworth’s in Blatchington Road – 1976 to 1979; what a team! Had such a laugh, and sometimes a few tears as well. Who remembers Mr Lister and his smelly cigars he use to smoke? I used to work in the stockroom, I was a very shy 17 year old, and it was hard work! Sorting all the deliveries out and putting away. Hope everyone who remembers me is OK and having a great life. I am now living in South Chailey near Lewes with my partner and my 5 year old son -yes 5! I was 49 when he was born – I’m 54 in May!!! Better late than never! Best wishes to everyone who knows me and RIP Woolworth’s. Greatly missed. Does anyone remember the sugar shortage in 1974? It was in the July of that year and was due to the reduction in sugar cane imports from the Caribbean. As the news broke many people just hoarded it so there was an even bigger shortage and rationing was discussed at the time. How did this affect me as a stockroom boy at Woolworths? Well, it was terrible when I look back but when we had a delivery of sugar we were instructed by the managers to distribute it to the staff as it was a perk of the job. Even then as a 17 year old I didn’t like it as it was unfair on the public but what follows turned out to be a favourite story of mine. One day an elderly gent went up to one of the counters, put some coins down and said to the assistant “2lb’s of sugar please”, of course she said “I am sorry sir but due to the shortage we haven’t got any”, to which he replied “So that great big Tate and Lyle lorry I saw out the back about 10 minutes ago was Scotch mist was it?” He repeated “2lb’s of sugar please”. He got his sugar and quite rightly any sugar delivery, however small, was then taken straight to the shop floor on a first come, first serve basis. I worked there for the Christmas period one year during the late nineties. It was the first time I’d ever done lates and it seemed to get in the way of my drinking at the time, although I became popular with Shelly, Pete, Bernie, Piers and especially Helen (had a thing for her at the time!). Does anybody remember the Australian lad Jeff? Me and him became good friends. George was a character and I can remember him and Joan catching me with my hand in the pick ‘n’ mix more than once. I still work in retail and find it an exciting and challenging line of work to be in. I loved my time spent there. In 1970 I started working at Western Road as a Saturday stockroom boy at 15….became a Floor Walker at the front of the store over shadowed by the then store manager Derek Harland. Some of the best days of my life. I miss everyone & those early years. Would do it again & buy another T shirt! Hi, just found this brilliant website. I worked at Western Road Woolies from 1974-75. Derek Harland was manager, Steve Mason deputy mgr, plus several trainees, Paul Matthews, Andy Payne, Brian May, David Trangmar, plus names forgotten ….great times. Editor’s note: Hi John – maybe you could tell us more about Woolies and your time there? Mail me? I remember Andy Payne as he used to be amongst the group of friends I had socially. I do remember we had two young men start with us as trainee managers at London Road, we had to train them in the stockroom for a few weeks before they went on to the shop floor. Their names were Stephen Brand and Mr Herschman, they went up to Western Road to continue their training when they finished at London Road. They were very nice chaps, I remember Mr Herschman was in a Barbershop Quartet. Hi John Coomber. It’s been a long time, some 40 odd years. I hope you are well.